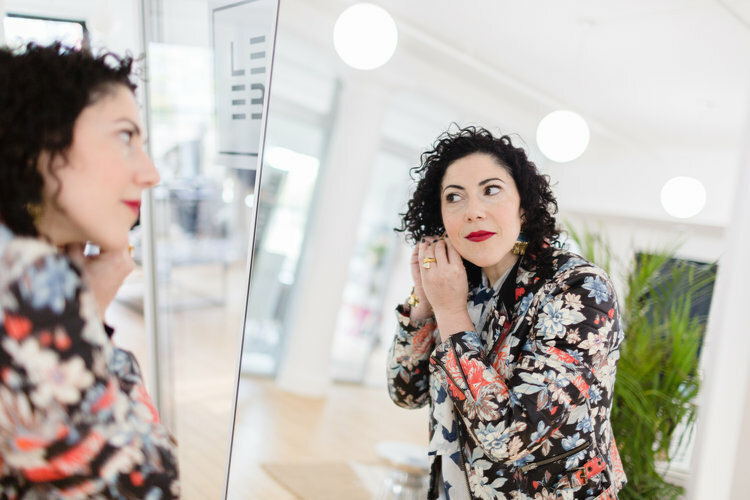 ACCORDING TO SARAH MAGID MORE IS MORE AND AFTER SPENDING TIME WITH THE LOVELY DESIGNER IT'S EASY TO SEE WHY SHE'S MADE THIS HER MANTRA. Look closely at Sarah's desk and you'll find a beautiful mess of her latest pieces amongst physical sketches (Sarah claims that the art of the sketchbook is still alive and well! 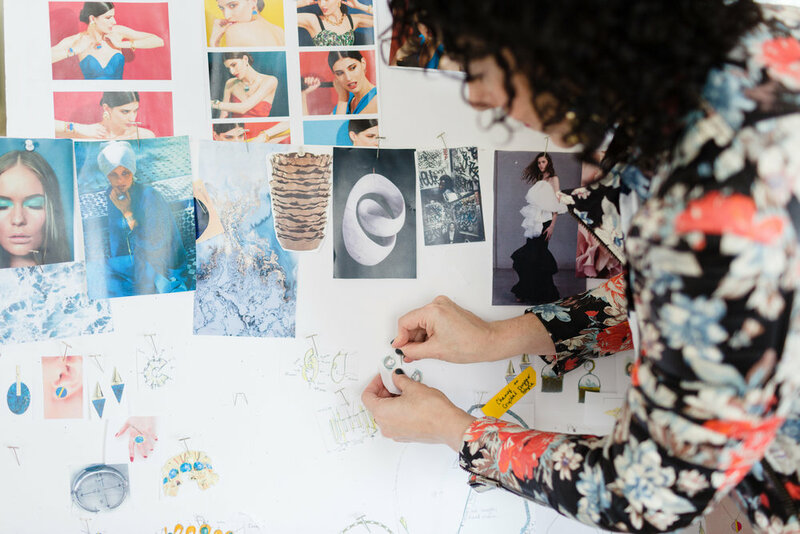 ), mood boards in progress and other colorful odds and ends that inspire the designer and her process. 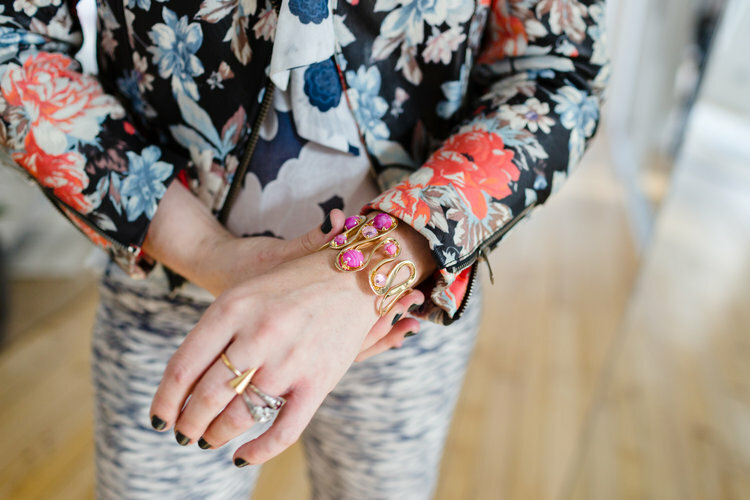 Fueled primarily by art and design Sarah's pieces are truly full of life and provide a magnetic finishing touch to any outfit. 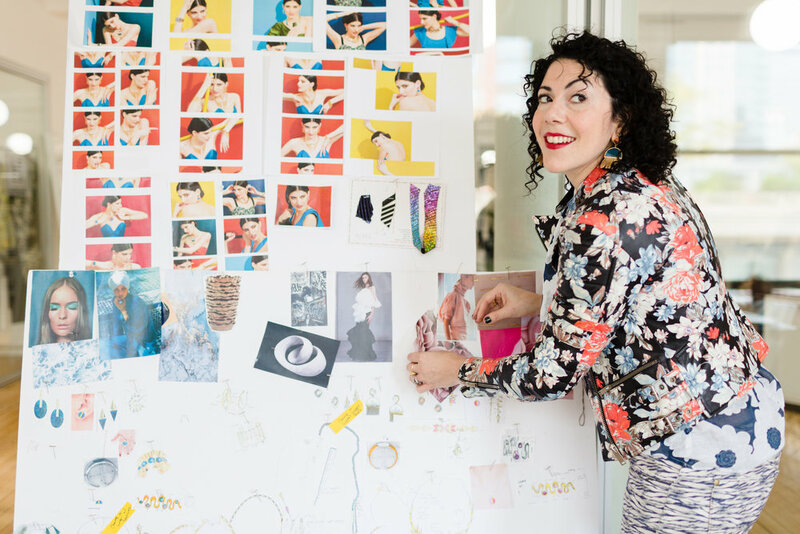 Drawing from her background and prior work as a designer for brands like J.Crew, Henri Bendel and Coach, we were interested to speak with Sarah about the process of launching her namesake brand, what it's like to be part of New York's growing contemporary design community and what she's assembling daily in her business. 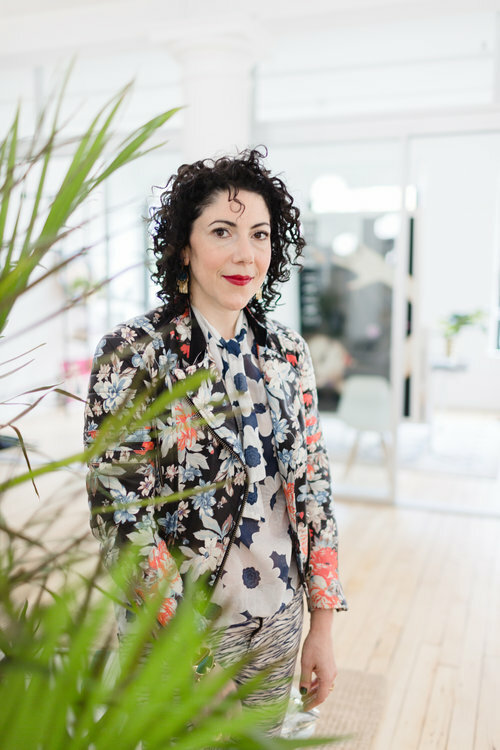 Luckily for us, Sarah set up shop at our New York space and shared more on what she has coming up this season. Read all about it in our chat below and also visit The Style Line for an exclusive second part of our interview. I am originally from Southern California, I came to New York when I was 18 for Sarah Lawrence College and New York grabbed me by the heart. I have never left, even though I still have no idea how to buy a winter coat and dream of Meyer lemon trees that grew in my childhood backyard. My tribe is my family and friends; my husband is an Author/Reporter and we are both artists living with a lot of passion and drive. My son is 13, inherited my fashion obsessed gene and is into sneakers, photography, and ethnic food trips to Queens. My daughter is 9 and was born with special needs, she has opened my eyes in new ways, and this world is a better place with her in it. In our free time I do things like: dress in lots of jewelry for my son's soccer game; hit Flushing for duck brains and hand pulled noodles; make my weekly pilgrimmage to Beacon's Closet for vintage treasures; bake biscuits/meringue/cakes/or brownies, in that order or backwards; read the NYT front to back; go to the oldest synagogue in Brooklyn which happens to be in on my block in Greenpoint, visit museums or galleries, and try to gather friends for a meal or two. Flexibility is key in my life as a parent, mom, friend, and wife. FROM MODERN ART TO BOLD COLOR TO FEMININE GEOMETRY TALK TO US MORE ABOUT WHY THESE PARTICULAR ASPECTS INSPIRE THE BRAND. Art has always been part of my everyday life and a huge source of inspiration. The forms and colors found in paintings, sculpture and photographs of Contemporary Art is the starting point for each collection. I also take inspiration from architecture, and love the way geometric shapes give jewelry a feminine but modern sensibility. Intelligent, stylish and strong women always inspire me. I want the jewelry I design to celebrate the women that wear them and bring confidence and joy to their day. HOW DID YOU FIRST CONNECT WITH BRAND ASSEMBLY AND WHAT HAS BEEN THE MOST INSPIRING THING ABOUT BEING PART OF THE CONTEMPORARY DESIGNER COMMUNITY? We met the team when we went to Los Angeles and immediately felt a brain wave connection about their ideas for revitalizing the fashion markets. Other Brand Assembly members are supportive and positive - a real community of brands that encourage and support each other. DO YOU HAVE ANY ADVICE FOR FELLOW DESIGNERS WHO MAY BE LOOKING TO FIND A WAY TO SHOWCASE THEIR POINT OF VIEW WHILE STILL MAKING PIECES THAT ARE WEARABLE? I am trapped in the 80's a bit and love oversized bold clothing and jewelry. I always tend to design too large and have to scale back. You want to think of your collection like a cake; the sprinkles are the showstoppers, the frosting is the more cool but wearable pieces, and the cake is your core collection aka money makers. You can always have different frosting and sprinkles but make sure that the cake is good! WE’RE SURE THAT AS AN EMERGING DESIGNER NO DAY IS EVER THE SAME, BUT IF YOU HAD TO SHARE A BIT OF YOUR ROUTINE WHAT WOULD IT LOOK LIKE? WHAT ARE SOME ELEMENTS OF BUILDING THE BRAND THAT YOU DIDN’T LIKE OR FEEL CONFIDENT ABOUT WHEN YOU FIRST STARTED, THAT YOU’VE NOW GROWN TO LOVE AS THE BRAND HAS GOTTEN BIGGER? Coming from corporate fashion and not being in my 20's - starting a new brand at times feels risky and crazy. In the beginning, sacrificing a great salary and support team to shlep jewelry in the subway, and not have paid vacation time felt very real. But it also felt okay the more the company grew, those small sacrifices have been worth the happiness that comes from doing what I love. As the business grows I feel more confident about my choice and know it was the right decision. I also want show my son and daughter that at any age or time you can do what you love and figure out how to make it work. A daily routine always starts with an early rise and making lunch for my daughter. I have cat sushi molds I purchased on a recent trip to Hong Kong, and I pretend I am Chef Morimoto for her. After a few fashion crisis outfits, I head into our studio in the Flatiron District and the day is a mix of a. design revisions that come through overnight from the team at our factory b. appointments with stylists or buyers c. eating a really good lunch d. writing, photographing and sourcing content e. researching new artists, creating mood boards and designing another collection, and f. chocolate emergency run. AS WE HEAD INTO OUR LA SHOW WE’RE CURIOUS TO KNOW: WHAT HAS BEEN THE MOST INTERESTING FEEDBACK YOU’VE RECEIVED FROM BUYERS OR INDUSTRY PROFESSIONALS IN GENERAL? It's important to have a strong identity and point of view and deliver a consistent message, season after season. Buyers tend to watch the brand for a few seasons to make sure you are consistent and can follow through with production and delivery. Having an organized back of house is important, even in a small business environment. From our first day, we established a design + production calendar, inventory system and have always tried to think with the mind of a larger company. I am always creating: drawing, sketching, coloring new ideas. I also love discovering new artists to feel inspired by and to bank them in my mind for the next collection. I also try to do one kind deed a day; it grounds me in being grateful for my life and to spread good karma that will return.